Dairy farmers can now boost their use of cost effective home-grown cereals in cow diets by as much as 40% thanks to the launch of two new alkalising feed options from FiveF Alka Limited. Speaking to farmers at UK Dairy Day, FiveF Alka Limited director and nutritionist Malcolm Graham said the company was now able to offer every dairy farmer in the country a bespoke alkalised feed solution guaranteed to help them make the most of what they can grow on their own farm. “Farm users of our alkalising technology are now feeding 20-40% more of their home-grown feed materials, cutting feed costs whilst also increasing milk output and improving longer-term profit factors such as cow energy status and fertility,” he claimed. Mr Graham said that the availability of rumination monitoring technology associated with robotic milking systems – and the use of pH boluses to measure rumen stability over time – has allowed FiveF to develop new systems to make diet alkalisation as straightforward as possible. To complement the alkalising technology FiveF has developed over the last 30 years allowing farmers to make their own Alkalage, Alkagrain and Alkastraw, the company is now launching the opportunity for feed companies to make two new proprietary blended and pelleted feed ranges, both of which will be available from approved manufacturers in the UK and Ireland. 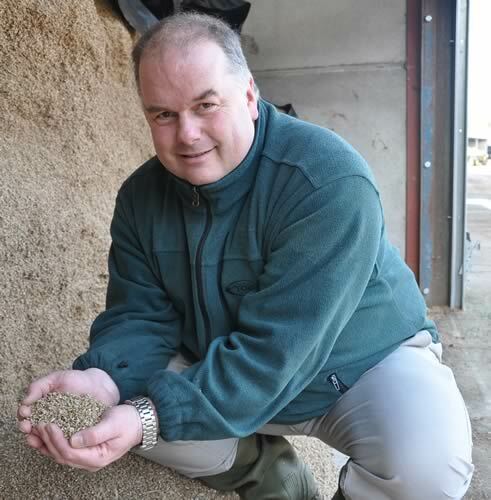 “The new Alkablend® blended feeds incorporate the super concentrated Alkagrain 150 Protein Premix at 20%, allowing approved blenders to produce a range of bespoke feeds made from the ingredients stocked to balance on-farm feed availability and quality,” Mr Graham said. Mr Graham added that with cereal and protein prices continuing to diverge, more and more producers are looking to feed more from their own acres. “The various alkalisation systems we have developed now allow milk producers to feed up to 8kg of wheat to high performing dairy cows, leaving plenty of scope for typical mixed farms to use more of their high value cereal, rather than selling it whilst current ex-farm market prices are depressed. Alkalising the feed has repeatedly shown in improvements in rumen pH stability, rumination time and feed intake. It really is a basis for making more effective, healthier milking cow diets that better utilise all the feeds fed,” he said. Farmers interested in the most appropriate alkalising system for their farm cereal growing and cow-rationing situation should contact FiveF Alka Limited for further advice.